GPM offers startup services, tailored to meet your needs. From physical installation (including confined space entry), to programming and training, we offer a full spectrum of startup services. Our services cover a wide range of brands, contact us and we'll help you determine what can be done for your site. We can help with integrating your existing instrumentation and PLC/SCADA system through calibrating the signal output of your primary element/transmitter to communicate with accuracy. 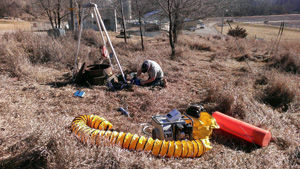 Flow pacing of an automatic composite sampler via a connected flow meter is a common project for us in the Midwest - we can help you too! If you require confined space entering of a manhole or space, we are trained, qualified per OSHA requirements and insured to meet your company policies. We bring with us the tripod, winch, air monitor and fresh air blower to safely enter the space at your site. Contact us today for your environmental startup service needs.